So usually when i write my blogs my lovely all singing, fixing and editing wonder, Sarah, corrects all my typos, tells me the sentences that make no sense whatsoever and adds plenty of apostrophes and commas in. Today…i’m leaving this post exposed because it’s personal. So as the fitness marketing guru Lucy Johnson says – 7/10 will do just fine! 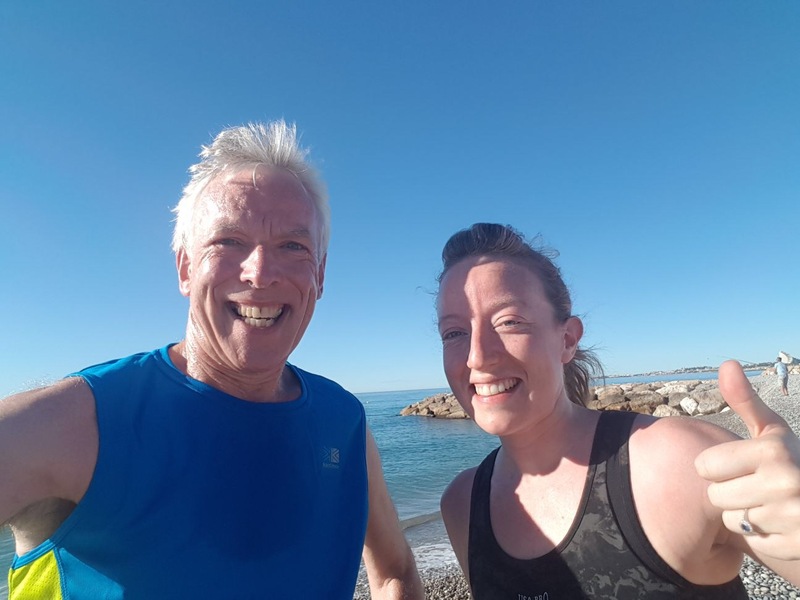 Last week, whilst on a lovely family holiday in the south of France, I got to run with my father on his 60th birthday. My dad, for those of you who don’t know him, is a terrible student and pays no attention to any of my professional advice. However, in credit to him, he’s more determined with exercise than anyone I know. People often worry for his welfare because he pushes himself so much he looks like he’s about to keel over! He’s one of few people i’ve met in my life who wouldn’t work harder with a personal trainer than he does by himself because he has that inner desire to just test his body and also a total stubbornness not to quit! As a result of this….we don’t run together that often! As we ran down the road on our 14km jaunt, aiming for the sea (where he had a swim mid run!) I was both grateful for having such wonderful parents and also being able to share my dad’s 60th with him in such a healthy and vibrant way. It seems to me that sixty is the age where people’s health starts to split more noticeably among two types of both personality and life choices. You get sixty year olds in their prime of life who embrace having less time with children reliant on them, take up new sports, go to the gym, eat healthier and embrace an active lifestyle. You also seem to get people who start to talk more about aches and pains, spend more time with their GP, rack up the medication cabinet and look towards retirement as a chance to sit still. You can guess which path my father is on. With all my work as a personal trainer and especially my work with weight loss clients, I have become increasingly aware of how lucky I am to have been brought up in a healthy household where exercise was encouraged and good food was eaten as standard. I have worked with many men and women who’s eating issues stem from their own childhood or even their parents childhood. Issues with clearing the plate, issues with drink, issues with using quick foods or just simply a lack of good nutrition. Over use of fast foods, a lack of active time never mind any physical activity. The right start goes a long way in adult life when yes, choices are your own, but so many behaviours and addictions can already be built in. So, as I ran with my Dad on his 60th birthday (and it was him that had to slow down for me on the hills!) I was impressed, in awed and grateful both to be with him but also to have the best start and example in life. This post is no criticism of anyone else’s parents or you if you are a parent, it’s simply my gratitude but I must add, if you are a parent, the BEST thing you can be is a good example. So get outside with your kids, eat well with your kids and keep moving! You might just out run them on your 60th birthday too! HAPPY BIRTHDAY FARJA BEAR, YOU’RE THE BEST!